Immediately in the west of the entrance of G I-e there are substantial traces of brick-work. It is to be noted that the rock foundation for the pyramid has not been faced to take masonry, but left in the rough natural condition. The bricks are now on the west side of the doorway and clearly belong to an entrance construction of the pyramid. The occurrence of an ascending passage cut in the rock in G I-e, and similar in character to that formed in the masonry of the Great Pyramid G I, tends strongly to confirm Petrie's belief of a single plan for the latter building, as against Borchardt's theory of a subsequent revision of plan, the ascending passage being added later. Immediately to the north of the cut sloping face for the casing blocks there are rough blocks let into the ground and mortared together. These may be in order to level the ground for the floor of the temple. With reference to the occurrence of the name of Snefru upon the golden canopy of the tomb G 7000 X it should be noticed that Dr. Fisher in his book "Minor Cemetery of Giza" (pages 157 - 166) describes the early mastaba of Snefru-hotep [Sneferu-hetep], who is described as the "Superior Libation - priest of the Pyramid Kha-Snefru". Clearly, if the inscription of [TRANSLITERATION] [dwAra] at Dahshur which by the way mentions specifically the southern pyramid [[GLYPHS] [jmj-r xa-snfrw Sma] is son of [TRANSLITERATION] [dwAnra]] (almost certainly at Meidum, and not that at Dahshur at all) (see Gauthier "Livre des Rois" I. 62) may be held to prove the existence of a pyramid of this King at Dahshur. 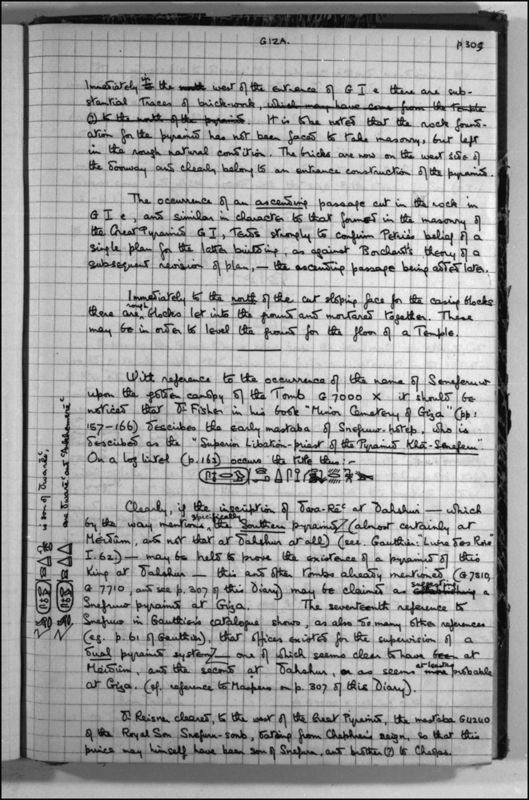 This and other tombs already mentioned (G 7510 G 7710, and see page 307 of this Diary) may be claimed as suggesting a Snefru pyramid at Giza. The seventeenth reference to Snefru in Gauthier's catalogue shows, as also so many other references (e.g. page 61 of Gauthier) that offices existed for the supervision of a dual pyramid system [[GLYPHS] [jmj-r xawj-snfrw] are [TRANSLITERATION] [dwAra] and [TRANSLITERATION] [anxmara]] one of which seems clear to have been at Meidum and the second at Dahshur, as seems at least as probable at Giza. (c.f. reference to Maspero on page 307 of this Diary). Dr. Reisner cleared, to the west of the Great Pyramid, the mastaba G 4240 of the Royal Son Sneferu-seneb [Snefruseneb], dating from Khafre's reign, so that this prince may himself have been son of Snefru, and brother (?) to Khufu. Remarks Owner of G 3008. South false door inscribed for Sneferuhetep, also appears in chapel wall painting, east, south, and west walls, identified as [rx nswt sS nswt sHD wabw xa-snfrw wr mDw Sma Hrj-sStA n nTr=f Hrj-sStA m kAt sxt] royal acquaintance, royal scribe, inspector of wab-priests of the pyramid of Snefru, great one of the tens of Upper Egypt, secretary of his god, secretary of works in the field; in situ in G 3008. Fragment of door jamb (UPM_E13543) inscribed for Sneferuhetep, identified as [rx nswt] royal acquaintance; found in debris of shaft G 3008 C, originally from door to offering room. Remarks Egyptologist. Nationality and life dates from Who was Who in Egyptology. (1863-1938) German Egyptologist; he was bom in Berlin, 5 Oct. 1863, son of Herman B. and Bertha Levin; he trained as an architect at the Technische Hochschule, 1883-7; he assisted in the Egyptian section of Berlin Museum 1887-8; between 1890 and 1897 he was in charge of building works at Konigsberg; Doctor hon. c. 1897; he studied Egyptology under Erman (q.v.) and first visited Egypt in 1895, working at Philae under Capt. Lyons(q.v. ); following de Morgan's great project to catalogue the standing monuments of Egypt ,he inaugurated a less grandiose scheme in conjunction with Maspero (q.v.) for the great (Catalogue Général of Cairo Museum; he became attaché to the German Consulate in Cairo; Borchardt founded and directed the German Institute of Archaeology, 1907-28, on his retirement, he founded his own institute which later became the Swiss Institute; he also contributed a great many texts and much useful information to the Berlin Dictionary; using methods partly derived from Dorpfeld he excavated the sun temple of King Nyuserre at Abu Gurab, 1898-1901, and the pyramids of Abusir; he also excavated and established reconstructions of Amarna houses, 1913-14; Borchardt was the first person to make an intensive study of Egyptian architecture as a subject on its own; he also discovered the workshop of the sculptor Thutmose at Amarna and enriched Berlin Museum with many fine objects from this excavation; another interest of his was chronology; he was a member of the German Arch. Institute, 1898, and a bibliography of his writings, 214 nos., was issued in 1933 to celebrate his 70th birthday; he published, Die aegyptischen,.-, Pflanzensaule1897; Denkmaeler des Alten Reiches (ausser den Statuen) im Museum von Kairo, pt. 1, Cat. Gén., 1901; Das Re- Heiligtum des Konigs Ne-woser-re (Rathures), pt. 1, Der Bau, 1905; Zur Baugeschichte des Amonstempels von Karnak, 1905; Nilmesser und Nilstandsmarken, 1906; Das Grabenkmal des Konigs Ne-user-rec , 1907; Works of Art from the Egyptian Museum at Cairo. With explanations by L. Borchardt, 1908; Das Grabenkmal des Koenig Nefer-ir-ke3-rec, 1909; Das Grabdenkmal des Konigs S'a3hu-rec, 3pts, 1910, 1913; Statuen und Statuetten von Koenigen und Privatleuten im Museum von Kairo, Cat. Gén., 1911-36; Die Annalen und die zeitliche Festlegung des Alten Reiches der Aegyptischen Geschichte, 1917; Quellen und Forschungen zur Zeitbestimmung der Aegyptischen Geschichte, 3pts. 1917, 1935, 1938; Die Altaegyptische Zeitmessung 1920; altaegyptische Festungen an der zweiten Nilschnelle, 1923; Portraets der Koenigin Nofret-ete aus den Grabungen 1912/13 in Tell el-Amarna, 1923; Agypten. Landschaft, Volksleben, Baukunst, with H Ricke, 1930; Allerhand Kleinigkeiten ... zu seinem 70. Geburtstage am 3. Oktober 1933, 1933 Beitraege zur Aegyptischen Bauforschung und Altertumskunde, with Ricke, 1937; Die Entstehung des Generalkatalogs und seine Entwicklung in den Jahren 1897-1899, 1937; Aegyptische Tempel mit Umgang, 1938; he died in Paris, 12 Aug. 1938, and was buried in Cairo. ASAE 39 (1939), 43-7 (portr.) U. Leibovitch); Chron. d .Eg. 14 (1939), 141-3 U. Capart) JEA 24 (1938), 248 (G. Steindorff); NDB 2, 455 (H. Ricke). Remarks Thomas Richard Duncan Greenlees, born South Africa, Sivaratri, March 10, 1899. British subject with a Scottish father and an English mother. For a brief period during 1925 he was a staff member of Harvard University--Boston Museum of Fine Arts Expedition, who later joined the Theosophist movement in India. Greenlees received his MA degree in 1922 from Oxford, where he studied Egyptian, Coptic and Arabic. April 2,1925, Greenlees appointed Assistant Curator of Egyptian Art at MFA.